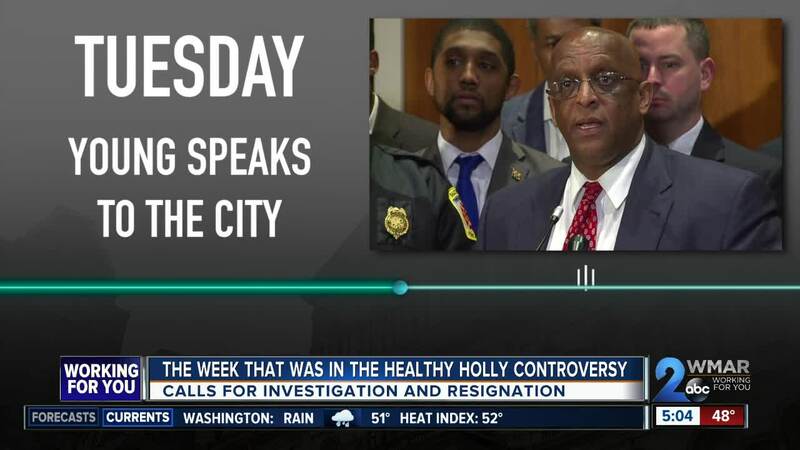 A look into this week's outline of Mayor Pugh's Healthy Holly controversy. BALTIMORE, Md. — Monday was frenetic. Beyond the University of Maryland Medical System Board's deal for $500,000 of 100,000 copies of Mayor Catherine Pugh’s book “Healthy Holly,” it was revealed that health insurance company Kaiser Permanente, which does business with the city, spent $114,000 for books as well. That development immediately triggered calls for resignations and investigations. Later that same day, Governor Larry Hogan chimed in sending a letter to the state prosecutor asking him to investigate. As the chorus of concern grew louder, late Monday afternoon Mayor Catherine Pugh released a statement saying she was taking a leave of absence as she battles pneumonia. At 12:01 Tuesday morning, Baltimore City Council President Jack Young became the acting mayor of Baltimore. Tuesday, Ex Officio Mayor Young held a news conference assuring Baltimore it is business as usual and that the city is stable. The budget, crime concerns, schools...all of it will continue to be addressed, he said. By Wednesday reactions continued to pour in and investigations began, while a former mayor forced to leave office herself a decade ago weighed in. While Sheila Dixon’s old campaign Facebook page asked, “What do you think Baltimore?” and was shared hundreds of times, Dixon said whoever posted didn’t have the authority. It was taken down, and the former mayor insisted she has not made up her mind about a mayoral run in 2020. Her focus instead, she said, is helping the city move forward. Dixon knows how Pugh feels; she had been here before as well. “All I can say is that, it is a process and a challenge that I don’t want to see anybody go through, and right now I can feel the pain that she must be feeling, and I don't wish this on anyone, and that's why, I think right now, her health is first and foremost,” Dixon said. During a news conference Thursday, City Solicitor Andre Davis said he cannot confirm the receipt of any subpoenas from any law enforcement to his office in city hall regarding Pugh. It would be part of an investigation the governor himself called for earlier in the week. For Hogan's part, he said he is holding judgment until he sees that investigation but admitted outside of Orioles Opening Day yesterday...it doesn’t look good.